I took this photo along with a penny to shoe the size of the project. I know it's not perfect but I do think it will be plenty good enough to gift. this is my 3rd tatting try. The bookmark will be 3 of these panels large. That is such a good way to show a size comparison. I was reading in your last post that you work night shift! What a hard shift to work! I am so tired during the day I don't think I could do nights ever again. 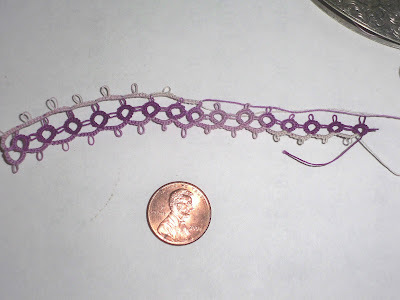 Anyway,your third try for tatting is very good! Keep up the good work! Thanks! I actually really enjoy 3rd shift. It does leave me rather tired at times like this week when I worked through last weekend and had a field trip with my 3 year old on Tuesday. But it also allows me to work and still do things with the kids. I did work days and it was really hard (not a morning person) I was way more tired than I am now. My Dad was over and he always enjoys looking at my different works and is rather amazed at the variety of stuff I do. He asked when I know to stop with the tatting and I said I can see the knots. He says I must have really good glasses! I'm actually near sighted and cannot read normal print further than a foot from my face! But I've had my rest and am ready to finish the bookmark. I have a long weekend ahead as Sunday is my Birthday so I took that night off and we are going to Portland to spend it with my grandma for her 80th. (my other grandma's 90th is next month and i have a bunch of crocheting and knitting to take to that one for gifts for the family. so after this bookmark I have to make another net bag and finish my stole for grandma.